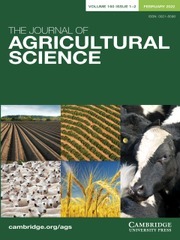 The Journal of Agricultural Science publishes papers concerned with the advance of agriculture and the use of land resources throughout the world. It publishes original scientific work related to strategic and applied studies in all aspects of agricultural science and exploited species, as well as reviews of scientific topics of current agricultural relevance. Specific topics of interest include (but are not confined to): all aspects of crop and animal physiology, modelling of crop and animal systems, the scientific underpinning of agronomy and husbandry, animal welfare and behaviour, soil science, plant and animal product quality, plant and animal nutrition, engineering solutions, decision support systems, land use, environmental impacts of agriculture and forestry, impacts of climate change, rural biodiversity, experimental design and statistical analysis, and the application of new analytical and study methods (including genetic diversity and molecular biology approaches). The journal also publishes book reviews and letters. Occasional themed issues are published which have recently included centenary reviews, wheat papers and modelling animal systems.